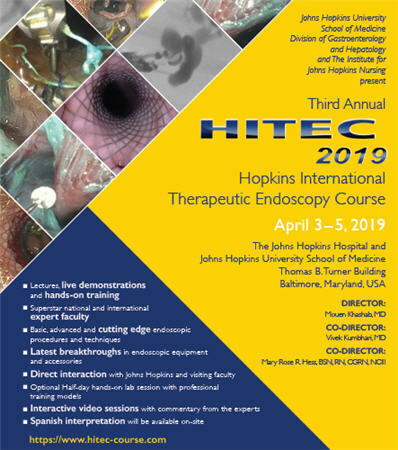 The Johns Hopkins International Therapeutic Endoscopy Course (HITEC) is an intense 2-3 day course dedicated to providing the practicing endoscopist state-of-the-art updates in luminal, pancreaticobiliary and bariatric endoscopy. In addition to extensive live endoscopy demonstrations and keynote lectures by superstar national and international faculty, our unique format will include faculty led lunch time symposia focusing on the various aspects of therapeutic endoscopy as well as video sessions that encourage opportunities to demonstrate rare cases not typically performed during live courses in the U.S. The pancreaticobiliary endoscopy sessions will illustrate basic and advanced principles and techniques of EUS/ERCP, cholangiopancreatoscopy and interventional EUS. 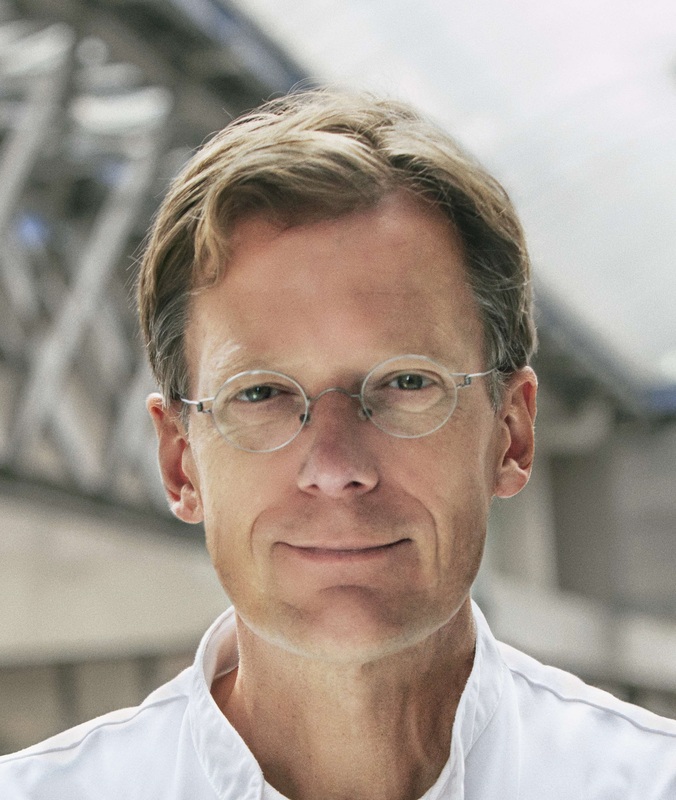 The luminal endoscopy sessions will focus on techniques such as Barrett's endoscopic therapy, EMR, ESD, POEM and EUS-guided anastomosis creation. The bariatric endoscopy sessions will demonstrate primary endoscopic therapies, as well as novel techniques to manage the complications of bariatric surgery. Therapeutic endoscopy hands-on training labs are offered with training performed by world-renowned experts. In short, this unique course featuring superstar global endoscopists will ensure detailed and comprehensive illustration of optimal techniques to enhance endoscopic skills, while simultaneously introducing advanced and novel procedures/techniques to endoscopists. Click here to visit the interactive conference website. Click here for more information on the Nursing Track. Discuss the latest advances in luminal and pancreaticobiliary endoscopy. Present an update on optimal techniques for biliary cannulation. 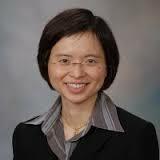 Discuss different management options for patients with complex colon polyps. Present an update on POEM and other treatment options for patients with achalasia. Discuss different management options for patients with pancreatic necrosis. Present an update on the endoscopic management of pancreatic cysts. Discuss a variety of bariatric endoscopic techniques, including primary weight loss therapies as well as those to treat the complications of bariatric surgery. Illustrate techniques and indications for endoscopic suturing. This activity has been planned and implemented in accordance with the accreditation requirements and policies of the Accreditation Council for Continuing Medical Education (ACCME) through the joint providership of Johns Hopkins University School of Medicine and The Institute for Johns Hopkins Nursing. The Johns Hopkins University School of Medicine is accredited by the ACCME to provide continuing medical education for physicians. The Institute for Johns Hopkins Nursing is accredited as a provider of continuing nursing education by the American Nurses Credentialing Center’s Commission on Accreditation. The Johns Hopkins University School of Medicine designates this live activity for a maximum of 27.75 AMA PRA Category 1 Credits™. Physicians should claim only the credit commensurate with the extent of their participation in the activity. PAs may claim a maximum of 27.75 Category 1 credits for completing this activity. NCCPA accepts AMA PRA Category 1 Credit™ from organizations accredited by ACCME or a recognized state medical society. The Johns Hopkins University has approved this activity for 27.75 contact hours for non-physicians. This 27.75 contact hour educational activity is jointly provided with The Institute for Johns Hopkins Nursing. Continuing Medical Education credit is being requested from another applicable medical specialty organization. Successful completion of this CME activity, which includes participation in the evaluation component, enables the participant to earn up to 27.75 MOC points in the American Board of Internal Medicine’s (ABIM) Maintenance of Certification (MOC) program. Participants will earn MOC points equivalent to the amount of CME credits claimed for the activity. It is the CME activity provider’s responsibility to submit participant completion information to ACCME for the purpose of granting ABIM MOC credit. Is POEM the New Gold Standard for Achalasia? Taking ESD to the Colon: How I Do It? How Do I Get my ADR to 60%? Advanced Therapeutic Nursing Track Emergent Call System: Who’s on First? Who’s on Second? Who’s in the Cleaning Room?